This summer, we enrolled our toddler to Pre-school summer classes to prepare him for Nursery and admittedly, we failed. Wes is already three and a half years old and may already be accepted as Nursery in school. I remember my older son Dandre, who started summer play school just right about Wes' age now. We got him into the right school and it worked perfectly well for him. We did the same for the little one expecting to have the same readiness and excitement for school as his kuya did. I realized this when after a few days in summer school, he was already making up reasons not to go and if he agrees to go to school, he's using all his delaying tactics. He's quite impressive in Picture Recognition activities because we read a lot of books at home and he's just naturally curious about a lot of things. He asks a lot of WHATs and WHYs and we answer him with much glee and excitement of his desire to learn. Wes recognizes opposites too like the concept of long and short, big and small, smooth and rough, tall and short and even happy or sad. Until... the instructor started controlling his small hand to answer a number of activity sheets which I think Wes has no understanding of yet. I think he wasn't enjoying here anymore. Look at the smirk on his face. The whole time I was just observing and letting the instructor do her job. I just let Wes be. I didn't tell him what to or what not to do. He goes to school all dressed-up, carries his little McQueen school back pack and snack box filled with his favorite chocolate drink and cookie. He was excited during his first three days. 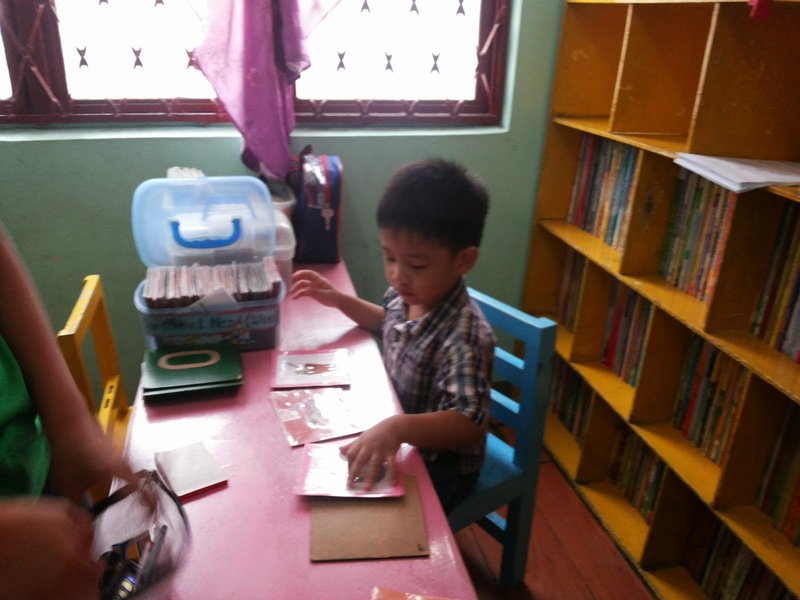 As he went along, we observed that when he enters the classroom he heads straight to table activities and paper work. I could imagine his heart screaming this, "Can I play first?!!!!" In my older son's pre-school, play and socialization were priorities than academics. But play wasn't part of his daily school experience. "Preschool is really for socialization, to introduce the idea that learning can be fun, and to teach kids how to share, compromise, and get along as a group." As expected, on his seventh and eighth day, he started crying whenever we mention that it's time to go to school! He would hurriedly go back to the room, pretend to sleep and refuse to take a bath or dress up. He now dislikes the idea of school. Honestly, I feel bad because I failed somewhere. 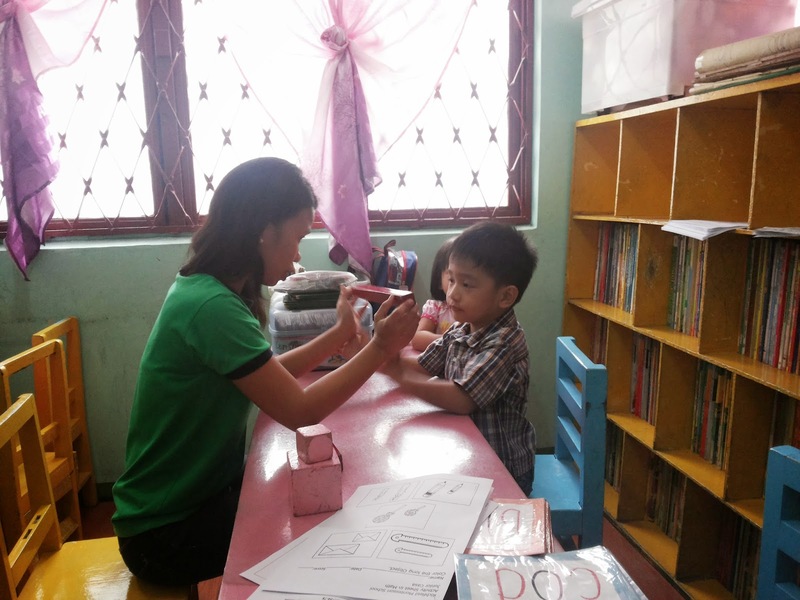 We were supposed to enroll him this school year as Nursery, but because of this, we are skipping this year and we decided to just allow him to play more, explore more, and have more fun at home. It's important to make time out of your very busy schedule to research on schools offering programs that encourage the child to learn through play and socialization. It's important as well to ensure that the curriculum the school offers is right for the age of the child. We did our research and asked around. The school where we enrolled him this summer was the most recommended. Apparently, how they do it wasn't fit to what our child needs. Yes, we've done our research and according to it, this school offers this and that. Although I personally came to the school to check its facilities, I failed at checking how they facilitate their methods of teaching during an actual class. I paid right away (at least half of the summer class' fee) because I got excited for my son being in school already. EEEP, too much excitement didn't work for us. We want our son to be in school at the right age, not too early and not too late. But if like what happened to us, our son doesn't want to go to school anymore, then we're giving him a break. Consider all pros and cons, talk to your partner/husband/wife about it, decide and never force the idea of school to your child. It may be counter-productive and may develop unlikeness to school in your child. There's still Kinder and Preparatory anyway. 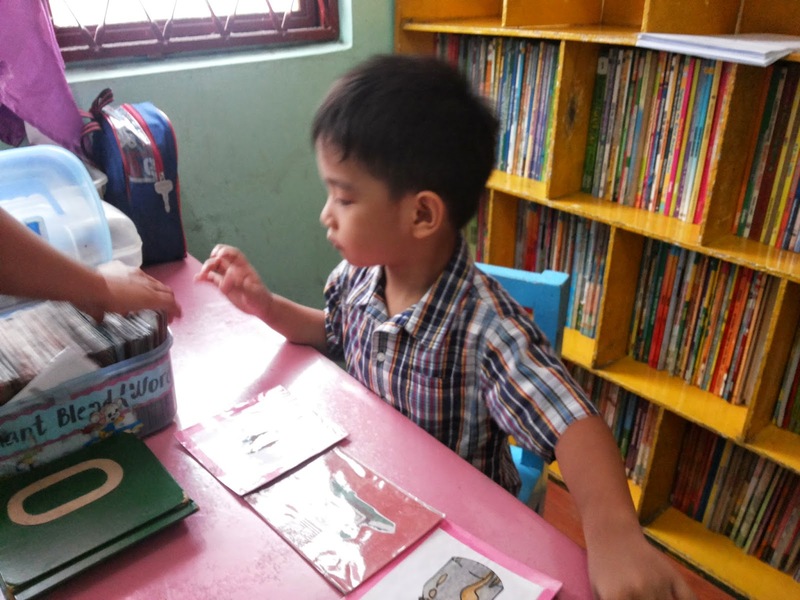 Now that we've decided not to put him to formal schooling this year, it's important for us to spend more time with him and find a way to home school him more. This also means, spending time to research what lessons should we be teaching him as well. 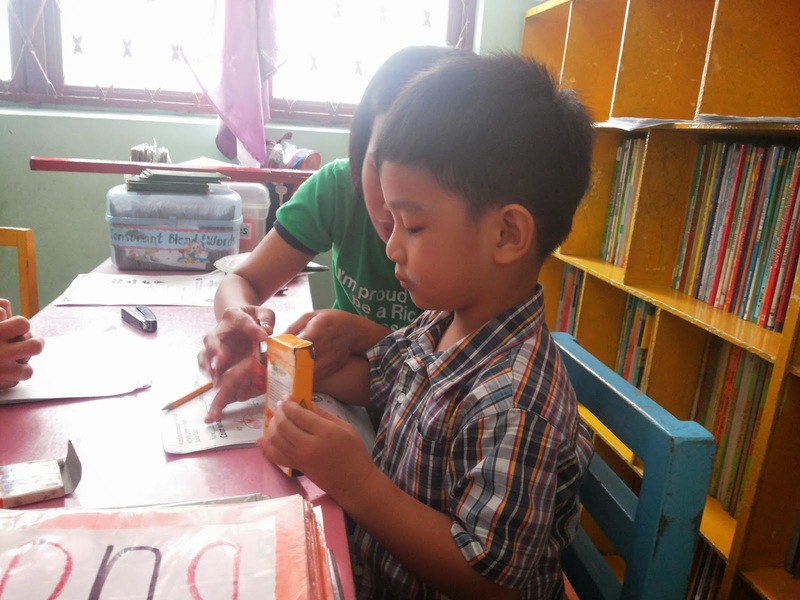 Although we already taught him and he's knowledgeable about the alphabet, numbers, colors, shapes, opposites and he likes drawing and coloring. I will make sure to instill in him that learning is fun and that it doesn't have to be too serious at all. Not this time. After all, it's true that the best teachers for the child are his parents! I'm a second time mom, and indeed, parenting and motherhood is a totally different experience altogether for every child. It's like I'm starting all over again. Hits and misses are part of it. But I'm happy to be taking this journey the second time around (and third hopefully next year!!!). I wouldn't have it any other way! Happy parenting loves! Hi Sis! Matt just had his summer class and he'll be in Kinder1 in June. Maybe it helps that I'm already homeschooling him, even if it's unformal. Saka siguro kasi malapit lang kami sa school and everyday pag nagstroll sila dadaan sya doon. Lagi nya sinasabi sa akin na yun daw school nya. He loves going to school BUT nagkaroon kami ng problem with his behavior. Nabbore sya and he will say na alam na nya, that's one of the downside na nahomeschool ko na sya. Nakaraos naman kami ng one month. 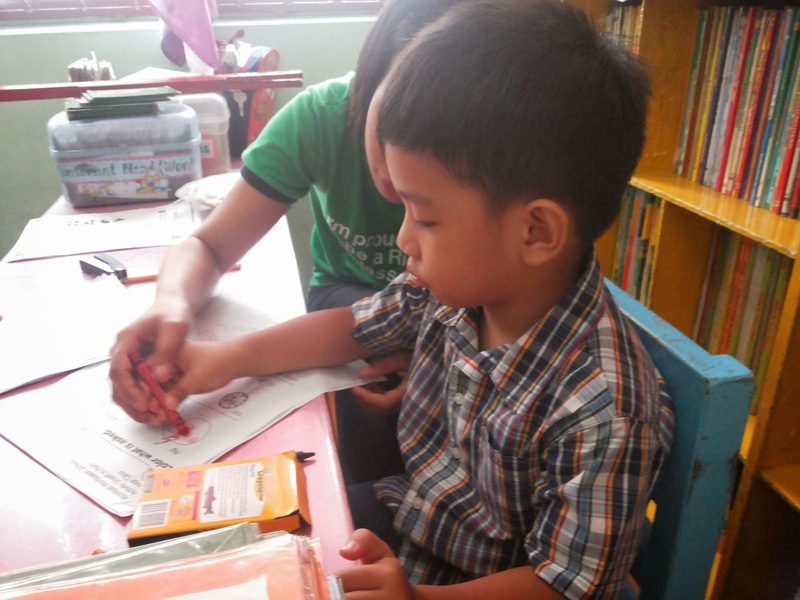 The teacher said he's good per makulit, hehe... In fact he can skip Kinder1 daw but for me that's not a good idea and we are not in a hurry since he will just turn 4 in June. Hello Louise ! Out of my seven kids who are now mostly teens (two having finished college) I could not recall having difficulty preparing my kids for schooling especially on their first day except for Sidney who has autism and gets bored easily with school subjects because she prefers to tinker with computers and loves the outdoors, that she chose to stop schooling for a few years . I did listen to her but now that she enjoys joining funs runs , I used that a motivation for her to go back to school. I still need to see how it will work come June. Personally, I am one parent who does not conform to the norm. I am not one to pressure my kids academically. If I feel my kid is not enjoying with what he does, I ask him why and observe . Stress can already be felt and seen everywhere and our kids are not immune to it all. There is a great difference once you see the spark of interest in your kid at a very young age, that kind of interest that will not hinder them from finishing their studies no matter what. Luckily I was gifted with kids who value their schooling. I also hope that your youngest boy will eventually get interested again in going back to school at the right time. Thankfully, when we took my daughter to the school she'll be attending this year, she felt right at home. I almost cried because when the teacher called her so they can walk to the room with the other kids for the trial class, she immediately let go and said, "Goodbye Mommy!" Naluha tuloy kami ni hubby at ang akala naman kakapit pa sa amin. Di pala uso sa kanya ang ganung drama. Haha! thanks for the advice Louise. i am worried din on how to introduce schooling to Neo. baka mabigla. i like your point "dont force the idea". siguro they will learn at their own pace din.